Thunder High On The Mountain is the third track of Joe Satriani’s 2018 album, What Happens Next. It’s a simple and fairly short rock song with some epic riffs and licks. For guitarists looking at playing some Satriani songs but don’t feel up to the challenge of some of his more complex songs, this is a good one to learn. 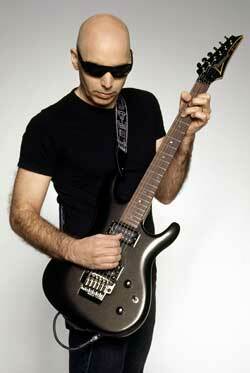 Joe Satriani has been inspiring guitarists for decades with his unique instrumental music. Over the years his albums have ranged from straight-forward rock all the way to experimental electronic-inspired songs. Some of his songs feature technically demanding solos, while others are easy enough that an intermediate guitarist can learn. What I like about Satriani is how he explores different styles and puts his own unique spin on things. He’s heavily inspired by blues, but even his blues-heavy songs don’t sound like typical blues players. Studying Satriani’s music is an excellent way to understand how to apply different music theory ideas. In my article on Always With Me, Always With You, I break the song down and analyze how he uses a simple key change to change the feel of the song. If you want to learn how to apply modes, looking at Satriani’s music is a great way to learn how to get started. The tuning of this song is a half-step lower than standard (Eb Ab Db Gb Bb Eb). You can still play it in standard tuning (the below Guitar TAB is written for standard tuning), but if you want to play along with the song, it’s worth tuning down. The tempo is a nice cruisy 129bpm. Read through the tips on tone to fully understand how to play this part. The key point to remember with the above lick is that you don’t pick any of the notes. I’ll explain this more in the technique section. Some licks are impressive because of their complexity. I like this lick for its simplicity. 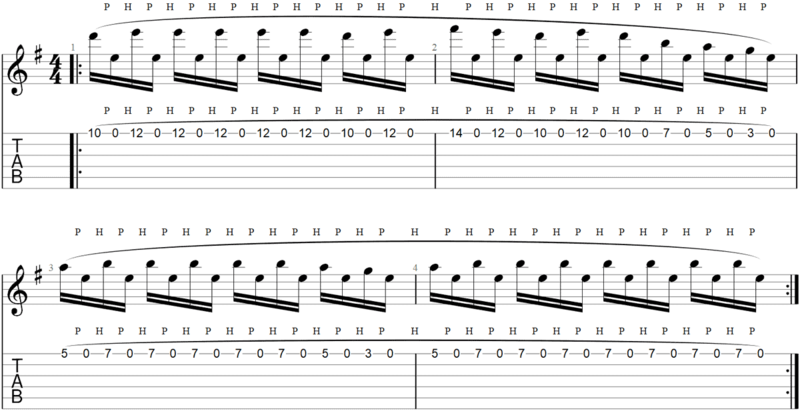 With some basic scales knowledge, you could easily write a lick like this one. I recommend trying to write your own lick in this style after you learn this one. It will give you good practice at thinking about melody and how to create interesting ones. What makes it sound so good is the way it fits with the pounding rhythm of the drums. There are no rhythm guitar parts during this lick, only the bass drum (or toms) and ambient synth sounds. This is a good example of why you should think about what the other instruments are doing when coming up with guitar parts. If there were rhythm guitar parts and more complicated drums in the background, this lick wouldn’t fit as well as it does. The backing instruments give this lick plenty of room to shine. If we ignore the tuning and pretend the song is in standard tuning, this lick is based on the E minor scale. The F# is the only sharp note, which fits the E minor scale (E F# G A B C D). We know it’s E minor and not G Major (which uses the same notes) because of the focus on the open E string. Try coming up with a similar lick using the open G string and you’ll hear how the open G string changes the feel towards Major. Think about which of the fretted notes are the most important in this lick. Which ones stand out to you? The 12th fret (E) and the 7th fret (B) are played more than any other note. This shouldn’t be a surprise as E is the root note in the key of E minor and B is the fifth. The fifth is a very stable interval (check out my lesson on intervals here), which gives this lick a solid sound. Pedal tone licks like this one (a pedal tone is when you repeatedly bounce back and forth between one note – the open E string in this lick) are a great way to experiment with modes. This lick is in E minor – or the E Aeolian mode. By adjusting this lick, you’re able to easily switch into different modes with E as the root (eg: E Phrygrian, E Mixolydian, etc.). This is something I often show my students how to do because it can quickly open up new doors to your playing. Learning how to easily change between modes and pick the right mode for any part is a valuable skill to learn. If you have trouble figuring out how to change this lick into different modes, that’s something we can work on in my Skype Guitar Lessons. Because you don’t need to pick any of the notes, your picking hand can be used to mute all of the other strings. Rest your pick against the B string and your palm and fingers against all the other strings. This ensures that none of the other strings will ring out and create unwanted noise. Keeping things quiet is really important for legato licks like this one. While this is an easy lick to learn (compared to other Satriani licks), I recommend starting off slow. Practicing this lick at a slow tempo will give you great practice at developing your fretting hand technique. When you play this lick at a slow tempo, unless you use good fretting technique, you’ll have trouble getting the notes to ring out clearly. So by slowing down, you can check that you’re using hammer-ons and pull-offs properly. The trick to getting these notes to ring out clearly is to hammer-down hard onto the string, then slightly flick the string as you pull-off. The goal is to keep the string vibrating. To do that, you need to keep adding energy to the string. If you lightly hammer-on and gently lift off your finger, the string will stop vibrating and the notes will die off. The good news is that if you use good technique, the lick becomes easier as you increase the tempo. This is because it’s easier to keep the string vibrating at a higher tempo. So if you have trouble getting the notes to ring out clearly at full speed, it’s a sign you need to work on your technique. Slow down and work on the way you hammer-on and pull-off. Cranking up the gain can be a lot of fun, but it can also hide sloppy technique. A good guitarist can make this lick sound great using a clean tone. I recommend practicing this lick by alternating between a clean tone and a drive tone. The clean tone will let you hear every little imperfection in your playing, which is a great way to improve your technique. The pulsing rhythm of the drums acts as a metronome when Satriani plays the lick. Practice this lick with a metronome to develop a good sense of timing. If you have a programmable drum machine, that’s even better as you can practice along with the kick drum just like in the song. The key point to remember here is that you only want to practice with the metronome after you’ve developed your fretting techniques. Trying to play this lick along with a metronome before you develop your technique will make you rush and play sloppily. Take your time and gradually increase the tempo. The goal is to be able to play a rock-solid version of this lick. Even for a simple lick like this, it takes time and patience. If you play this lick and compare it to the album version, you might notice it doesn’t sound quite right. The album version sounds an octave lower than written here. That’s because Joe uses an EHX Micro POG (read my review of the EHX Micro POG here) to shift the pitch down an octave. Any pitch shifting pedal that allows you to adjust the mix should work just as well as a Micro POG. All you need to do is set your pedal to pitch shift an octave down, then turn the mix to 100% so you only hear the wet (pitch-shifted) signal. 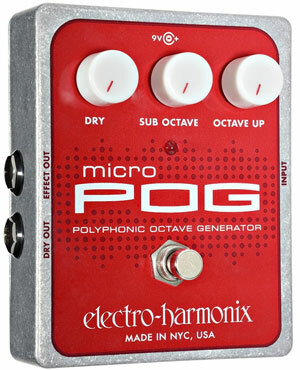 On the Micro POG (shown to the right), turn the ‘Sub Octave’ knob up and the ‘Dry’ knob to zero. This gives you the same result as using a Whammy pedal and shifting the pitch down an octave. You end up hearing your guitar an octave lower than normal. That’s how Satriani gets his thick tone from the high E string. If you need help with your technique or want to learn more about the theory behind this song, I can help you with my Skype guitar lessons. We can dig into the rest of this song, work on the licks and riffs, or analyze the theory behind the song. You can learn how to write your own songs in a similar style, along with creating a backing track to jam with. If you’re keen to take this song further or learn more songs in a similar style, book in a lesson with me. If you want to learn more about Joe Satriani and his music, check out my lesson where I analyze the song Always With Me, Always With You. It gives you a great look at the entire song and breaks down the theory.